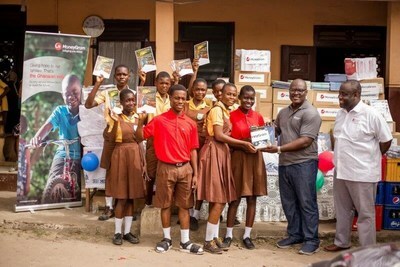 ACCRA, Ghana, April 6, 2018 /PRNewswire/ — MoneyGram, a global provider of innovative money transfer services, is thrilled to announce that the MoneyGram Foundation has distributed books, notebooks and school supplies to about 1,000 students at Osu Home Primary & JHS School in Accra. The event reflects MoneyGram Foundation’s commitment to improving lives of children worldwide by providing equal access to early education. “As studies show, educational skills can improve over time when interventions start at an early age. I’m happy to be here today with my colleagues from MoneyGram to distribute school supplies and talk about the importance of reading. Through our donation and engagement, we hope to inspire the change that will improve educational opportunities for children across Africa,” said Patrick Appiah, MoneyGram’s regional head for West Africa. The books are part of a global book distribution grant through First Book, a U.S.-based nonprofit social enterprise focused on equal access to quality education for kids in need. The donation is just one of many educational efforts funded by the MoneyGram Foundation in the region. In 2013, the Foundation awarded a $60,000 grant to Pencils of Promise to support the establishment of an e-reader program in four community schools in Ghana. Since 2013, the Foundation has awarded over $600,000 in grants towards building infrastructure, supporting technology, and promoting literacy in Africa. MoneyGram established the MoneyGram Foundation in 2012 to help children around the world gain access to educational facilities and learning resources. Its mission is firmly rooted in the belief that education is at the heart of better economic opportunities, healthier families and individual freedom and empowerment. The MoneyGram Foundation is focused on inspiring minds and improving lives and grants funds to deserving organizations with this mission in mind. To learn more, please visit moneygramfoundation.org or connect with us on Facebook.